The importance of doing great fret work on your guitars can not be over stressed, and having the right fret crowning file can help you do your best work in less time and with less frustration. I believe quality fretwork plays a large part in making your guitars feel more comfortable and look great too. If you’re a guitar player, or if you have spent time with any advanced guitar players, you may have noticed that the player’s left hand is very sensitive to even the tiniest changes in the way the frets are crowned or how the fret ends are shaped. 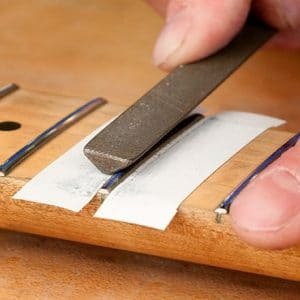 Proper fret crowning specifically plays a major role in making sure your fret tops stay perfectly level, (which you need for low action) and it increases the accuracy of your guitar’s intonation as well. We’ll get into discussing the fret crowning tools themselves and how to choose the right one soon, but just in case you are reading this and you’re new to fretwork, I wanted to address a few questions you might be having like: What is Fret Crowning? 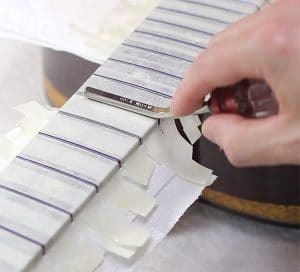 Technically fret crowning is when the fret is shaped back into a nice even, rounded and comfortable shape after the fret leveling has been completed. Just knowing that much is OK, but if you really want to master your fretwork, you’ll need to look a little deeper. Why Do We Need To Crown The Frets? So, since we know that the frets are a little bit out of whack either from the installation or just from regular playing wear, then what we need to do is level the fret tops. You can do this with a fret leveling file or with a fret sanding beam. Essentially in the leveling stage you are grinding the tops of the high frets down until all the frets are making even contact with the straight edge when you place it on the frets. The leveling process has a side effect though, it leaves you with uneven fret tops that are flat in some places and rounded in others. That inconsistency looks bad and can throw off the guitar’s intonation as well. We know that crowning the frets is how we reshape the fret tops (or the fret bead) back to a nice even rounded shape with the high point over the center of the fret. Keeping the point of contact (Where the string contacts the fret) on center is what keeps the intonation accurate. BUT remember all that leveling work we did? That has to be preserved as well. Do the reshaping in a way that will preserve the perfect level surface we created in the fret leveling process. Be sure to make the high point of the crown directly over the center of the fret to ensure accurate intonation. OK, Now we know the steps we need to take and we understand why, next let’s look at some specialized fret files to give us an advantage and help us do our best work. Back in the old days, we just used a regular file and did our best to keep things even. 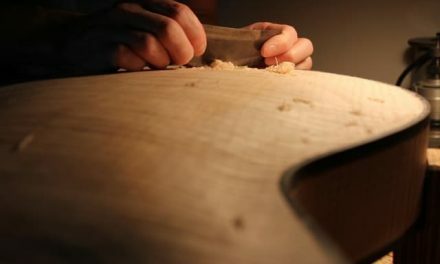 Some luthiers still prefer to do it that way, and as we get into this more you’ll see that as with just about everything in lutherie, there is not really a right or wrong or best or worst tool. The goal is finding which tool works the best for YOU and with your style. So Let’s look at the different elements of Fret Files that make each one unique and more or less suited to your style based on your preferences. Toothed Crowning Files – These are actually files in the literal sense, they have sharp toothed surfaces of metal that cut the fret material. I used this type for years, but eventually switched because when they get a little dull, they can chatter leaving more work for you later in the fret polishing stages. 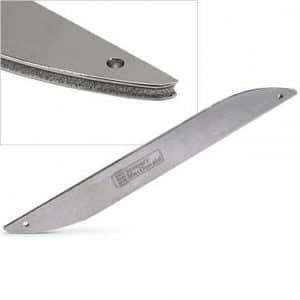 Diamond Grit Crowning Files – These fret files have a diamond coating on the cutting surface and can be purchased with different grits depending on how aggressive of a cut you need. I find these to be more constant, last longer, and work better for harder fret wire like stainless steel as well. Flat Cutting Surface – These files just have a flat surface and the rounding of the fret is up to the way you move the file as you cut. Radius Cutting Surface – These files have a radius shaped into the cutting surface. This helps to shape the fret crown as you move the file across it. The trade off here is that you may need several files to match the different fret sizes you use. However, I find this produces much more consistent and higher quality work in less time for me, so it is well worth it. 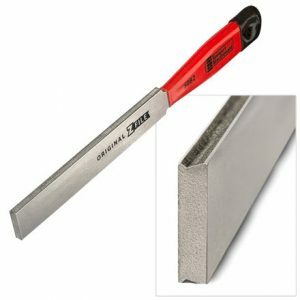 Z Cut Surface – This is a new type of file that has a Z shaped cutting surface to allow you to be as accurate as possible when preserving that level top surface you made in the frets when you leveled them. I haven’t tried these yet but they look great and the idea makes perfect sense. Straight File – The file shape is an important element as well. 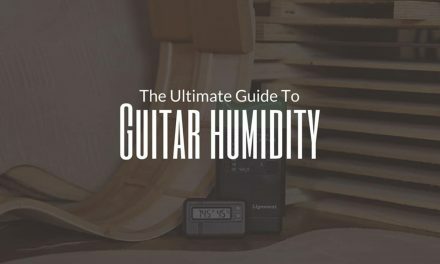 You need a shape that you are comfortable with especially in the areas like the fingerboard extension where you are working very close to the delicate spruce top of the guitar. 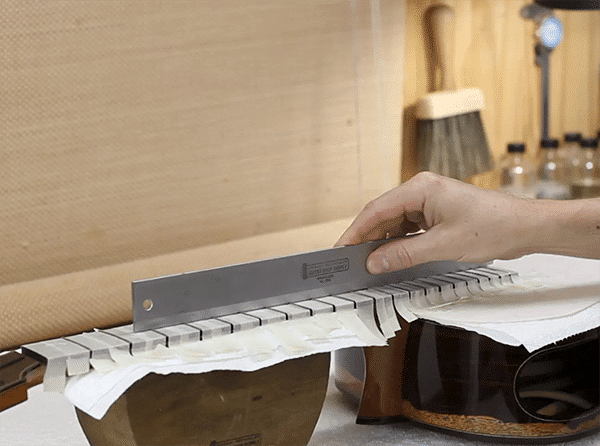 Offset Handle – This file shape is my favorite because it makes me feel more comfortable in the upper frets while working over the delicate spruce or cedar guitar top with less chance of slipping and hitting it. 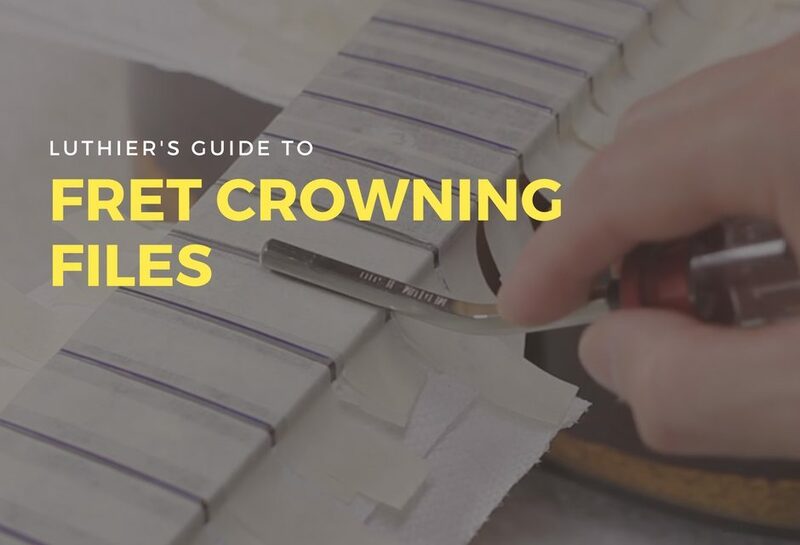 I think we covered all the bases now, we know what fret crowning is, why it’s important, what the different elements of fret crowning file design are, so…let’s check out some crowning files! Instead of just a boring list, I’ll start off by sharing my personal journey of discovering which type of file I like best and that I use on my guitars. I started here as most people do because I didn’t have the money at first to buy all the special luthier tools. I just used my belt sander to grind off the edges a little on a normal metal triangle file and it worked fine. Mine was certainly not as good as this beautiful Stew-Mac version (see picture) but you have to do the best you can with what you have. Next, I graduated to this crowning file, it was amazing to be able to work so much faster and the shape of it is still one of my favorites to this day. Getting this file was a big improvement and I was very happy for a while until at some point in the 90’s there was a Stainless-steel fret craze that hit. After a couple of those jobs my file was getting pretty worn out and starting to chatter a lot more, leaving much more to try to fix during my sanding / polishing phase of the fret work. So that got me looking around at what was new out there and led to my next discovery. I got this one and was instantly in love with the diamond coating because it was super sharp, cut like a dream, and didn’t seem to wear out even on stainless steel fret wire. The one thing I didn’t like was that it didn’t have that shape I had come to love on my Gurian file. Yes it does have a nice shape, that works well but I was used to that other one and kind of wished I could have the diamond file with that shape. I ordered this baby and have never looked back. They call it a dual grit diamond fret file. 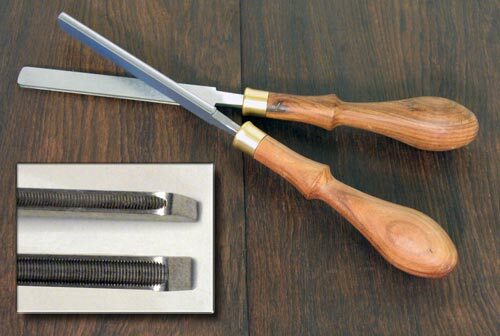 This is still my favorite tool for the fret crowning job, as you will know if you have taken my Fretwork Mastery Course where I talk about it and demonstrate my techniques and tricks. It has the shape I like, the diamond grit coating, and it even has two grits so I can rough the crown in quickly and then switch to the finer grit to finish things off. This file also has the radius or concave cutting surface as well. Now you know my story (as it relates to crowning files anyway – you can learn my whole story when you sign up for the free Art Of Lutherie Newsletter & Get some free videos too: CLICK HERE ) and my preferences up to this point, but I must include a few more files to make this list complete since there are some cool new types of fret files I haven’t personally gotten a chance to try yet. 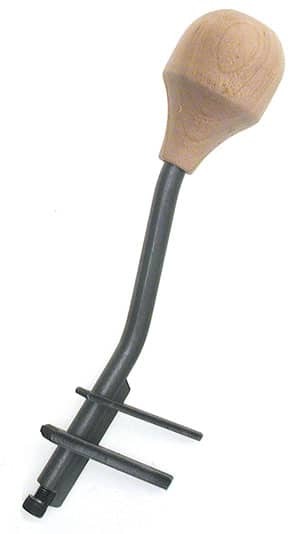 This file has the traditional straight shape but with the radius or concave cutting surface. 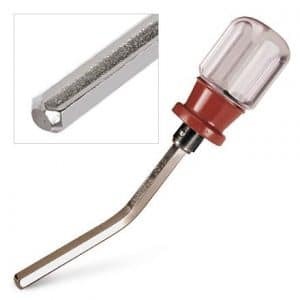 It is double edged and cuts with traditional file teeth so it can remove lots of material fast on one side and a finer tooth on the other side for perfecting your work. You can find these all over the place but I love the beautiful wood handles on these from LMI. 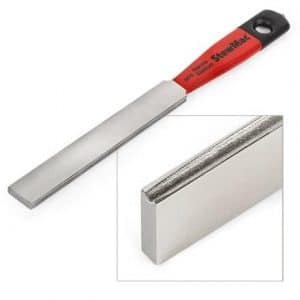 Here is a really cool new idea, it is just like the straight diamond file I described above, BUT it has a totally unique cutting surface. The idea (as I understand it anyway) is to have more control of shaping on the sides of the fret and more accurately preserving the leveled fret top surface for the best playability. I haven’t gotten a chance to try this one yet, but I am looking forward to getting my hands on one soon, and when I do I’ll be sure to do a video review for you guys. As I mentioned earlier choosing the right fret crowning file is largely a matter of personal preference and you can do great work with any one you choose. BUT one thing I always stress to my students in the Luthier’s EDGE is that no tool is perfect, AND the most important part of any guitar work you do is YOU. 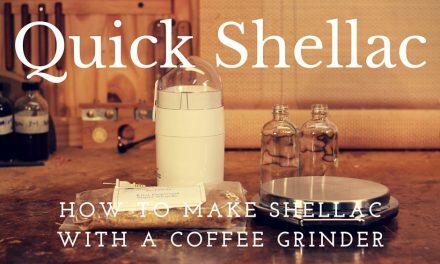 You can adjust your technique to make any of these files work and you can even just use a regular old file and produce amazing results if you take your time and have a good understanding of the “WHY” so you can make the right choices and prevent errors. 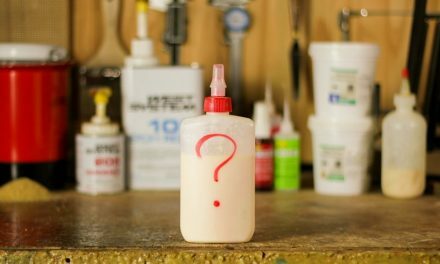 Having the right tool is only half the battle, the technique and methods you use will play a huge role in determining the final quality of your fret crowning work. Remember the fret crowning is key to intonation, action, and playing comfort. The technique is hard to explain with words but not to worry, I have a video sample for you (taken from the Luthier’s EDGE course – Fretwork Mastery 1 & Fretwork Mastery 2) where I’ll be showing you a little bit of my fret crowning technique so you can put that new crowning file to some good use. Check out this video where I share some of my techniques for producing perfect Fret Crowning results every time. Free Fret Crowning Technique Video! 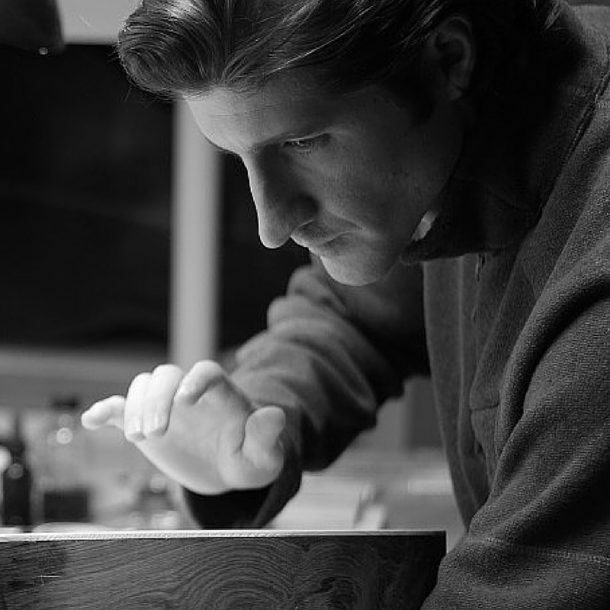 If you enjoy the videos above you will love being a part of the Luthier’s EDGE, Click the link below to learn more about it and join our growing global community of pro luthiers and first time builders who love the art of hand crafting guitars as much as you do! 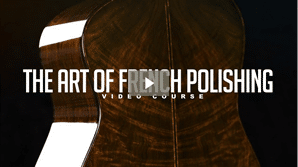 Ready To Take Your Guitar Building Skills To The Next Level? 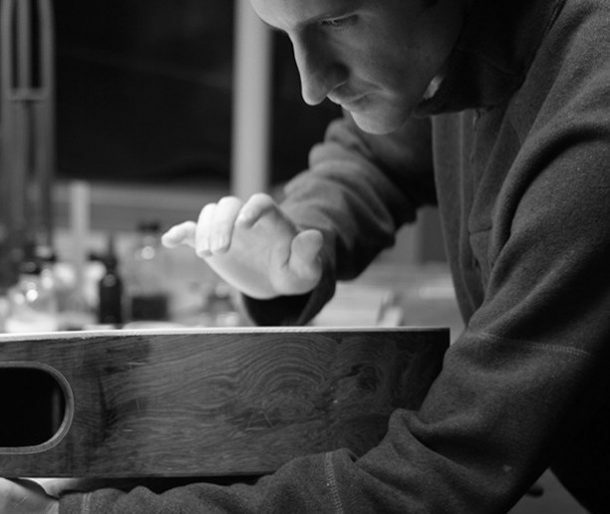 Join Luthier's EDGE and get access to a growing library of exclusive guitar making luthier courses, tutorials, and more.